Web game clone or serious upgrade? SteamWorld Dig is an interesting game. You play as a robot miner named Rusty, and you are looking for your missing uncle in a mine. Rusty runs across his uncle's corpse, and then your first goal is to mine some ore. The story and the objectives change as you progress through the game. You start out with just a pickaxe, but eventually you will unlock boots that you can run faster in, dynamite you can throw, and more. Some of these take up a water meter, which you can refill by jumping in water. Make sure your lantern has fuel in it, if your light goes out you can’t see ore! The game doesn’t really tell you the controls, so I’ll explain them. Rusty learns more moves throughout the game, but there are hints on how to use them. How do you go back up? Wall jump of course. After you mine ore, bring it up to the surface and sell it. As you sell more ore, more tools and power-ups will be unlocked to buy from stores, as well as finding certain items in caves. The power-ups range from increasing your max health, max water, upgraded pickaxe or drill, and more. Some items require orbs to buy; some don’t cost money but only costs orbs. Keep an eye on your orb count, as orbs are more rare than ore. Does this game sound familiar? Well then you must have played the web game Motherload. SteamWorld Dig is basically an upgraded, portable version of Motherload. Is it worth paying for? 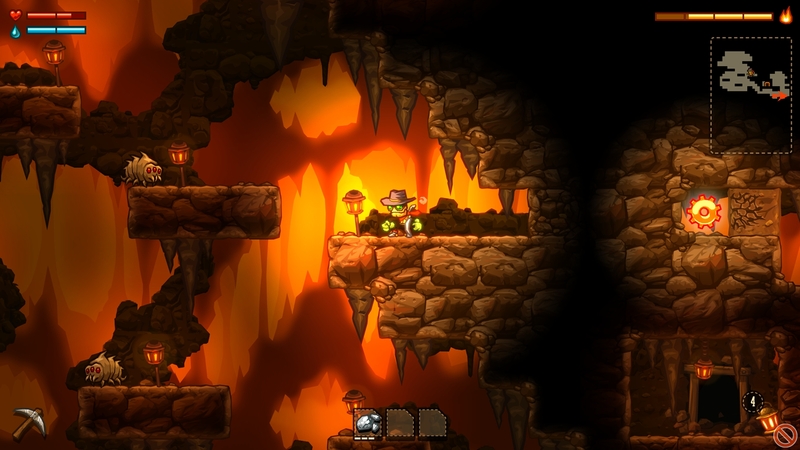 SteamWorld Dig has more of a platformer feel, and if you like Motherload, you will love this game. Lets talk about the enemies. I may have bad-mouthed the graphics and sound, but the enemies make up for it. At first the only enemies you will face are small bugs that just walk left and right, but it goes to enemies that will throw dynamite, enemies that will chase after you and explode, and more. There is even a final boss, and it is pretty hard. The enemies are tough to fight sometimes, as you can lose health fast. I died quite a few times on the final boss alone. Overall I thought the enemies made the game, as if there were no enemies the game wouldn’t be as much fun. It only took me just under 6 hours to beat SteamWorld Dig, but it was a lot of fun. I completed it in only two play sessions; it was addicting enough to play for 3 hours at a time. Yes the graphics and sound aren't the best, but the gameplay is great. Is it worth paying about $10 for a game based on a free web game? Maybe, it depends on how much you want to spend, but if you like Motherload and want it on the go this is the game to get. I think the spritework for this game is superb. The graphics may not be all that impressive, but the art style most definitely is. Well written review Gamergy, I would've awarded the game the same score. This game is on my radar now because of your review! Nice work dude. This sounds like what Spelunker for the NES should've been, brilliant review Gamergy. @NINTENBRO82 For the look they were going for I thought it was good, but overall still fell short in my opinion. I really wish the 3D was better, however I don't think the score would be any different, as I base my scores more on the fun factor than graphics. @Rukiafan It's a fun game, but too short. I bet if I did a speed run on it I could beat it in under 5 hours, but for $10 you'll get your money's worth. I didn't like this game very much, but I know it's just a matter of preference of games. This review is very nicely written @Gamergy. This is a great game, though I agree that it is too short. Superb review. The game starts off slow, but after the first 15 minutes it gets much better. At first I read that as Elite Beat Angels 2 and thought to myself what the?! Is this similar to Cave Story in any way? I wouldn't say it's much like cave story. The graphics look similar and the 2D platforming is, well, 2D of course, but in Cave Story you're shooting more. SteamWorld Dig is attacking with a pickaxe/drill. You do get an eerie feeling while playing, just like in Cave Story. Other than that eerie feeling and the same type of graphics, they are very different. Try playing the web game motherload before getting SteamWorld Dig, but motherload is basically a simplified version of SteamWorld Dig, and not as good. @Gamergy wrote: I wouldn't say it's much like cave story. The graphics look similar and the 2D platforming is, well, 2D of course, but in Cave Story you're shooting more. SteamWorld Dig is attacking with a pickaxe/drill. You do get an eerie feeling while playing, just like in Cave Story. Other than that eerie feeling and the same type of graphics, they are very different. Try playing the web game motherload before getting SteamWorld Dig, but motherload is basically a simplified version of SteamWorld Dig, and not as good.